In 2004, the SEC had 19 examiners per trillion dollars in investment advisor assets under management, says White. Today, we have only eight. As Securities and Exchange Commission Chairwoman Mary Jo White gave lawmakers on Tuesday stark statistics about the limited number of examiners the agency has to oversee advisors, Rep. Maxine Waters, D-Calif., said that she was “pushing very hard” to secure support for her user fees bill to fund advisor exams. During her testimony before the House Financial Services Committee, White reiterated the agency’s need for adequate resources. Last year, White said that the SEC was in a position to only examine 9% of registered investment advisors. “More coverage is plainly needed, as the industry itself has acknowledged,” she said. In fiscal year 2013, examiners conducted approximately 1,615 examinations, including 438 broker-dealers, 964 investment advisors, 99 investment company complexes, 42 transfer agents, 17 clearing agencies and five municipal advisors. The staff also conducted 50 market oversight program inspections. President Barack Obama’s 2015 budget proposal would give the SEC $1.7 billion, a 26% boost from the agency’s 2014 enacted level, and would allow the agency to add 316 staffers to the agency’s Office of Compliance Inspections and Examinations, with 240 of those examiners devoted solely to overseeing advisors. Rep. Waters’ user fees bill, the Investment Adviser Examination Improvement Act of 2013, H.R. 1627, would allow the SEC to collect user fees to fund advisor exams. Waters, ranking member on the committee, reintroduced the bill last April; it has garnered little support among the Republican-controlled committee. Neil Simon, vice president of government affairs for the Investment Adviser Association, said in early March that IAA and other planning groups are “working hard” to get a bipartisan user fees bill introduced in the Senate that mirrors Waters’ bill. Rep. Spencer Bachus, R-Ala., the former chairman of the House Financial Services Committee who now serves as chairman emeritus, told White during the Tuesday hearing that despite his failed attempts to get a bill passed supporting a self-regulatory organization to help boost advisor exams, that she continue exploring options to increase advisor exams. During the nearly three-hour hearing, White also said the she has spoken with Labor Secretary Thomas Perez about the SEC’s fiduciary rulemaking process as well as the department’s rule to amend the definition of fiduciary under the Employee Retirement Income Security Act. Moore asked White if the SEC is providing its expertise to the DOL. White replied that the SEC is providing its expertise concerning impacts of a DOL fiduciary rulemaking on the broker-dealer model. “I’ve ratcheted up that collaboration” between the SEC and DOL, White said, adding however that “at the end of the day, we are two different agencies” operating under two different statutes. 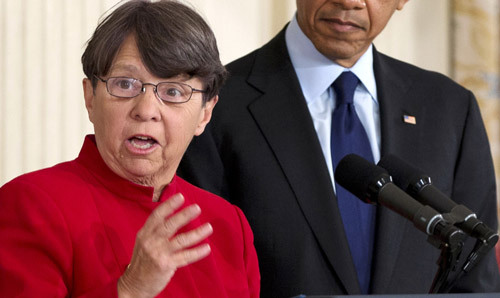 Check out Mary Jo White: The 2014 IA 25 Extended Profile on ThinkAdvisor.